Plants short-lived perennial, gla-brous, rarely pubescent, glaucous; taproot stout; caudex woody. Stems several-many, erect, branched and decumbent at base, rarely simple, 20-80 cm. Leaves mainly cauline, 2 per node, sessile, almost clasping, reduced proximal to inflorescence, blade broadly oblong to oblanceolate or lanceolate, rarely ± linear, 2-8 cm × 5-30 mm, base round, apex acute to acuminate. Inflorescences open dichasial cyme, 5-40-flowered, bracteate; bracts much-reduced, lanceolate. Pedicels 0.5-3 cm. Flowers bisexual and unisexual, some plants having bisexual flowers, others having pistillate unisexual flowers, 15-20 mm diam. ; calyx pale green, rarely purplish, campanulate, not contracted at mouth or base, inflated, 9-12 mm in flower, 12-18 × 7-11 mm in fruit, herbaceous, papery, venation obscure, reticulate, without conspicuous pale commissures, margins dentate, lobes broadly triangular, 2-3 mm, glabrous; petals white, ca. 2 times as long as calyx; limb obovate, emarginate to 2-lobed; stamens exserted by 2-4 mm; styles 3, cream to greenish, at most slightly pink tinged, 2 times longer than calyx. Capsules ovoid to globose, equaling calyx, opening by 6 teeth; carpophore 2-3 mm. Seeds black or nearly so, globose-reniform, 1-1.5 mm, finely tuberculate. 2n = 24. Flowering summer-fall. Roadsides, waste ground, gravel pits and shores, arable land; 0-2000 m; introduced; Alta., B.C., Man., N.B., Nfld. and Labr. (Nfld. ), N.S., Ont., P.E.I., Que., Sask., Yukon; Alaska, Ariz., Ark., Calif., Colo., Conn., Del., D.C., Ga., Idaho, Ill., Ind., Iowa, Kans., Ky., Maine, Md., Mass., Mich., Minn., Mo., Mont., Nebr., N.H., N.J., N.Y., N.C., N.Dak., Ohio, Oreg., Pa., R.I., S.C., S.Dak., Vt., Va., Wash., W.Va., Wis., Wyo. ; Europe. Silene vulgaris is less variable in North America than in its native Europe, where five subspecies are recognized on the basis of capsule size, petal color, leaf shape, and habit. All North American material appears to belong to subsp. 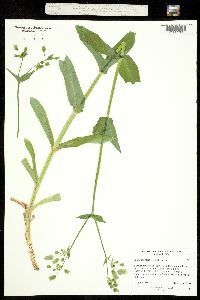 vulgaris, although a few collections from sandy habitats tend to have unusually narrow leaves. Similar plants from Europe have been named var. litoralis (Ruprecht) Jalas and subsp. angustifolia Hayek. Short-lived perennial herb with a stout taproot 20 cm - 0.8 m tall Leaves: mostly stem leaves, opposite, two per node, stalkless, nearly clasping, 2 - 8 cm long, 0.5 - 3 cm wide, broadly oblong to reverse lance-shaped or lance-shaped with a rounded base and pointed tip. Inflorescence: an open cluster (dichasial cyme) of five to forty flowers, subtended by much-reduced bracts. Flowers: white, 1.5 - 2 cm in diameter. Stalk upright, 0.5 - 3 cm long. Stamens ten, exserted. Styles three, two times longer than calyx. Sepals: fused at the base into a tube (calyx). Calyx tube pale green, rarely purplish, 9 - 12 mm long in flower, growing 12 - 18 mm long and 7 - 11 mm wide in fruit, inflated, bell-shaped, net-veined, papery, with five short lobes. Lobes 2 - 3 mm long, and broadly triangular. Petals: five, white, about two times longer than the calyx, blade reverse egg-shaped, clawed, deeply two-lobed. Fruit: a dehiscent capsule, three-chambered, opening by six teeth, equal to calyx, egg-shaped to spherical. Seeds black, 1 - 1.5 mm long, spherical to kidney-shaped, roughened. Stems: several, upright, branched, rarely unbranched, with a waxy coating (glaucous). Habitat and ecology: Introduced from Eurasia. Common in vacant lots and along railroads. Etymology: Silene probably comes from the Greek word sialon, meaning saliva, referring to the sticky secretion on many of these plants. It may also have come from the word seilenos, referable to Silenus-a foam-covered, drunken character in Greek Mythology. Vulgaris means common. My specimens were found in railroad ballast and in a pasture field. It has been reported from 7 counties.